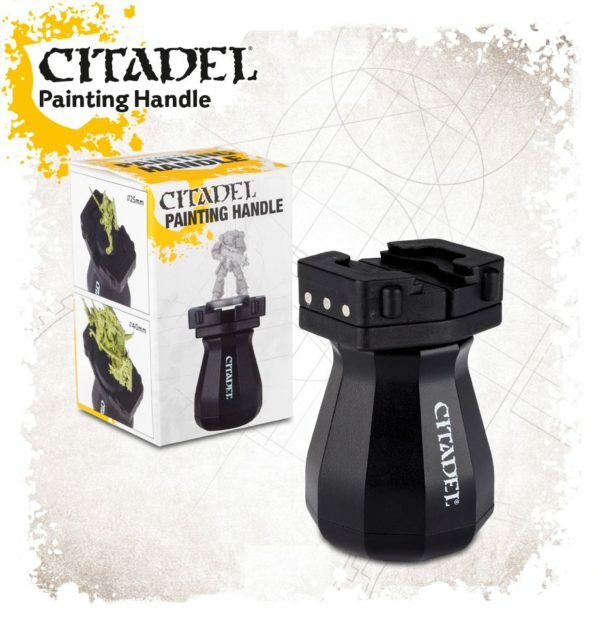 I’ve been looking for a better way to hold my minis as I paint them and some time ago, I saw that Games Workshop makes a miniatures “handle.” When I was looking for them six months ago, they were all sold out but they finally came back in stock and picked one up to see how I liked it. I decided to run a few quick tests to see how well it works. 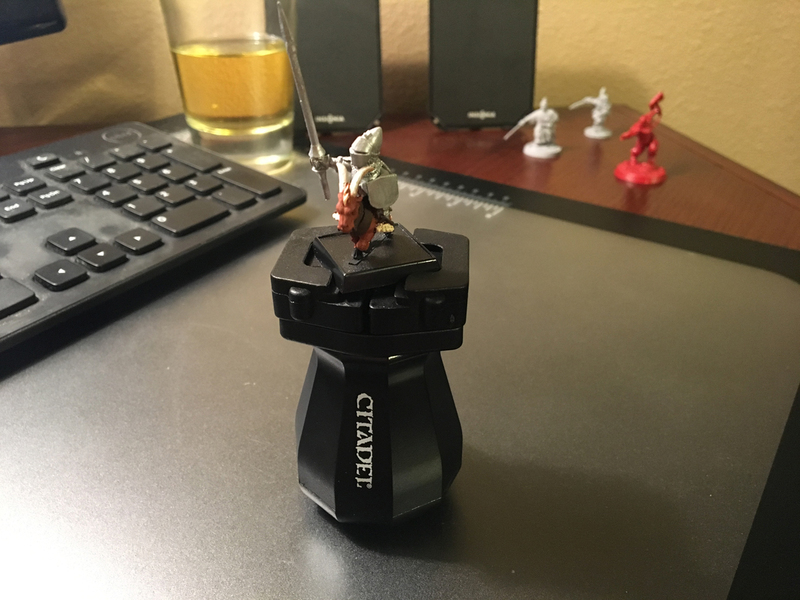 First up, I grabbed a mini with probably the smallest base I have in my collection: a Descent mini. 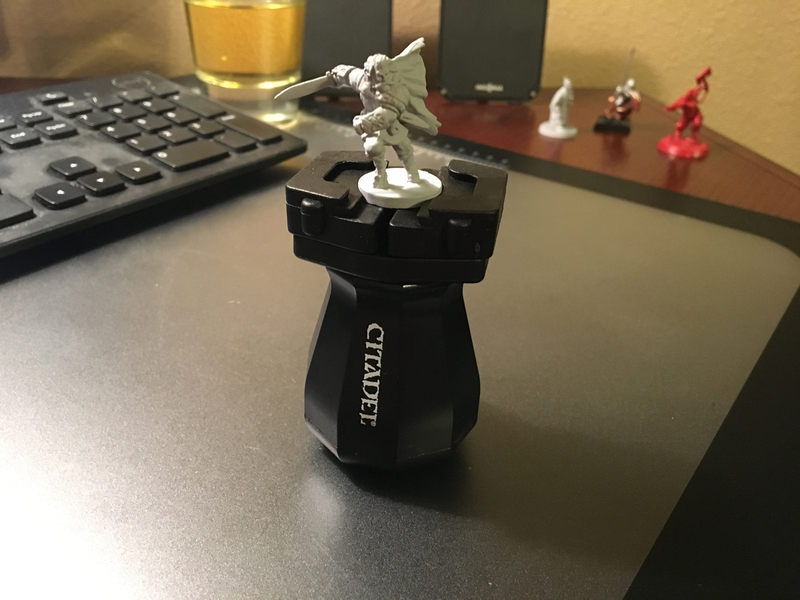 This minis base measures in a micro 19mm and is likely pushing the limits on how small the handle can hold without having to rig up something extra. Next we have a standard 25mm base on a Warlord Games’ Test of Honour figure. 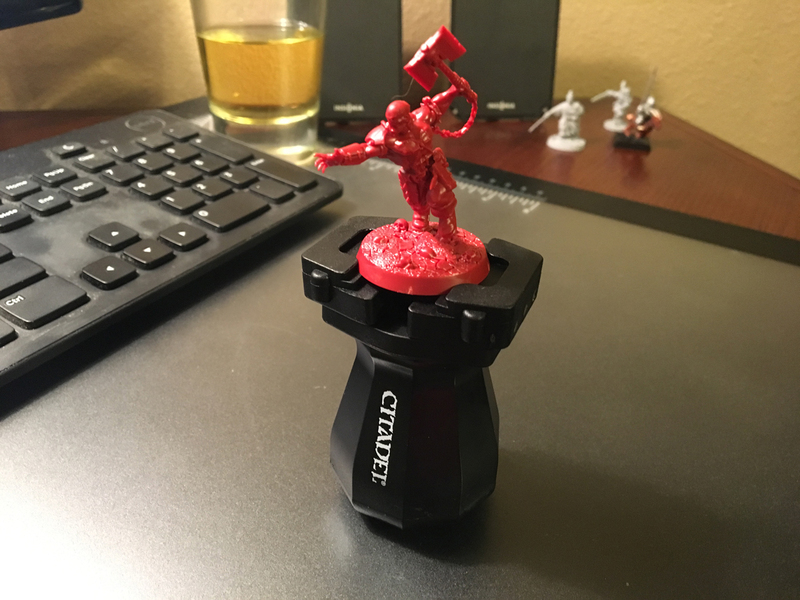 I’m messing with the angle a bit because the mini is metal and a bit heavier than an of the normal plastic or resin minis. The handle holds the miniature secure and I can be rough with it without it wanting to fall out. Next we have a larger base from GW’s Shadespire game. This base is 32mm and it works pretty well but I also did a quick test of the other Shadespire figure base which is 39mm and it also works, albeit it seems like that size is at the extreme edge of the handle’s capacity. Lastly, I grabbed a non-round base to test how it fairs and this square 25mm base worked fine as well. If I really mess with it, I can get the base to slip into another position but it never felt like it was at risk to falling out. Overall, I think the Citadel Handle is great at what it does. It feels comfortable and stable and will be a great improvement over trying to hold the mini still by its base alone. They run $8 MSRP and are well worth it. I may even decide to pick up another couple. I have to admit, the whole time I’m wondering what you’re drinking back there in the background. Handle looks, well, handy. Would you use it for spray/priming? I use sticky tac and a little wooden block (from Hobby Lobby) as a combo handle & to weigh things down when I prime. Ha! I wondered if that would come up. 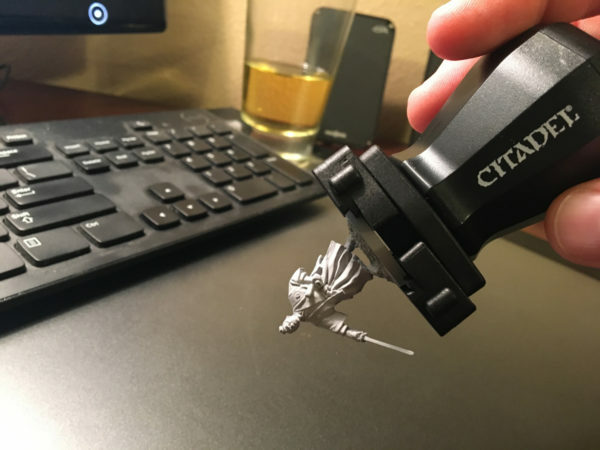 I probably wouldn’t use it to prime as I typically prime a lot of models at once and I wouldn’t want to get the handle caked with the overspray. The spring-loaded levels that hold the mini need slide against in their track and the overspray may mess that up and then it won’t hold the mini very securely. I do something similar to what you do: sticky tac on large nail heads. Nails rest in a 2×4 with holes drilled into to hold multiple models. It works well with normal light plastic models on 25mm bases but anything large and/or heavy gets tricky so I should move to your wood block method on those for stability.